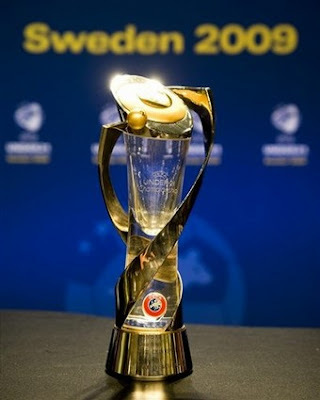 English youngsters came to Sweden with intention to win the championship. They defeated Finland 2-1 and Spain 2-0. In last game played (expected) draw that was enough for the first place. Considering names, England is a favorite today. Pearce has a headache caused by Agbonlahor and Walcott which appearance is in doubt. Odds are rapidly decreasing (?) and from 2.20 came to 1.85. Before the start, Sweden was outsider. They don't have well-known names in the team, the most of them play in domain competition. But, played excellent against Belarus and especially Serbia. Attacking style of play brought the results and some anonymous players (Marcus Berg) already took attention of some big European clubs. As English have advantage in established players, Swedish have a home ground. They're hosts which also means a little help from "men in black" (penalty-kick vs Serbia). I think England is closer to final, but both sides have some problems with defence lines and I choose goals. Bwin offers 2.20. Over. Italy youth are (as always) one of the main candidates for trophy. They have again talented squad, with Pierluigi Casiraghi in charge. Defence line is traditionally tough, while in attack play three, already big names, Balotelli, Acquafresca and Giovinco. They have some problems in midfield with the ball transition and that resulted in less goal opportunities. The only dilemma for Casiraghi is to return Balotelli in squad (served one game suspension), or to start the match with very good Abate, again. Germany displayed very good performances in the first two games, winning four points, with clean sheet both times. Against England, they took a point for the second place in the group. They're typical German squad, strong, team is well balanced, ready for war all 90 minutes. European press announcing this game as a battle of two defences and expect small number of goals. I give little advantage to Italy, think they can play tactically on higher level and have killer trio in attack. I rate the chance as 60:40. For me, enough for a bet. Pinnacle offers 2.57. Italy to win. Correct score 1-0.